Take a boat across the river. Walk along the roadside watching rice farmers seed their paddies until you come to the monkey gate. The monkey gate leading to Hanuman Temple, Hampi, India. Draw in a long, cool sip of water. Tighten your sandal straps. 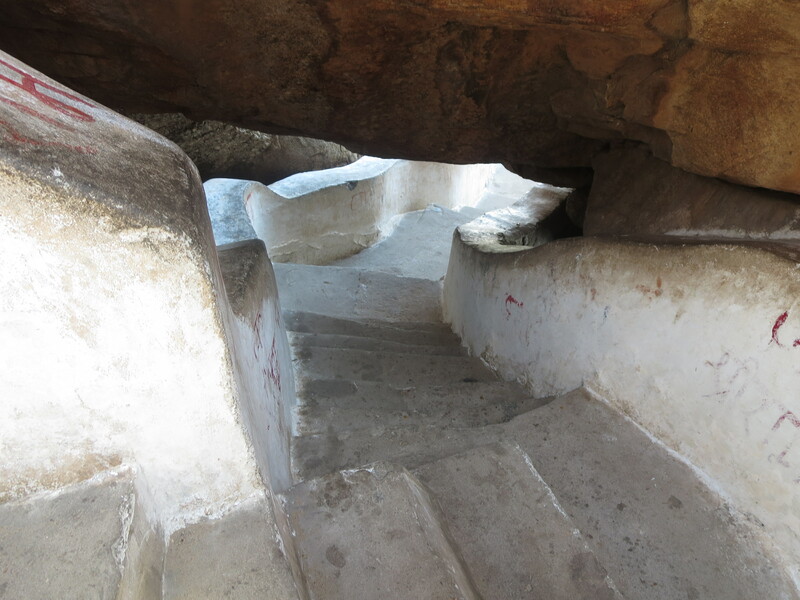 Now, before the full heat of the day accumulates, ascend the stairway carved into the solid rock hillside, counting the steps as you go until you reach the Hanuman Temple, built on the birthplace of the mythological monkey god. 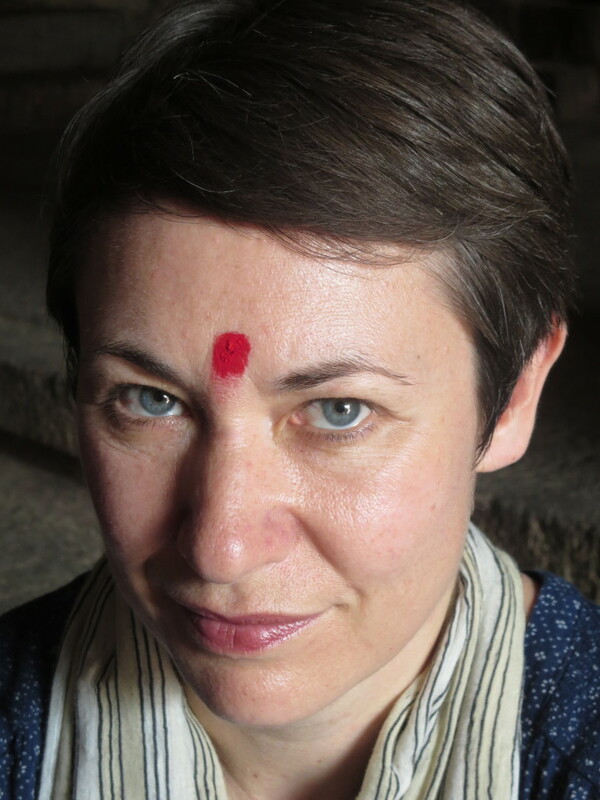 Four hundred and seventy-four, four hundred and seventy-five… Remove your shoes at the threshold to the temple courtyard and enter the sacred space. 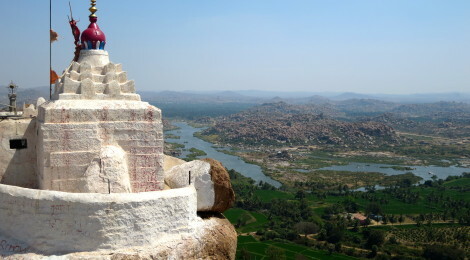 Some of the four hundred and seventy-five steps leading to the Hanuman Temple, Hampi, India. A generous breeze makes up for the heat and cools the sweat on your back through the cotton of your shirt. The 360 degree vista is both rugged and lush: boulder-strewn hillsides are softened by a patchwork of vivid green rice paddies, banana plantations and coconut palms on the valley floor. From this vantage, tucked in among the vegetation, you can see the ruinous remains of the 16th century Hindu empire that once thrived here. Carved stone temples, pillared promenades and royal elephant stables rest in hospice among the rocks. Inside the temple building a Saju chants a circular puja prayer. His voice plumes up and out across the hilltop like incense. 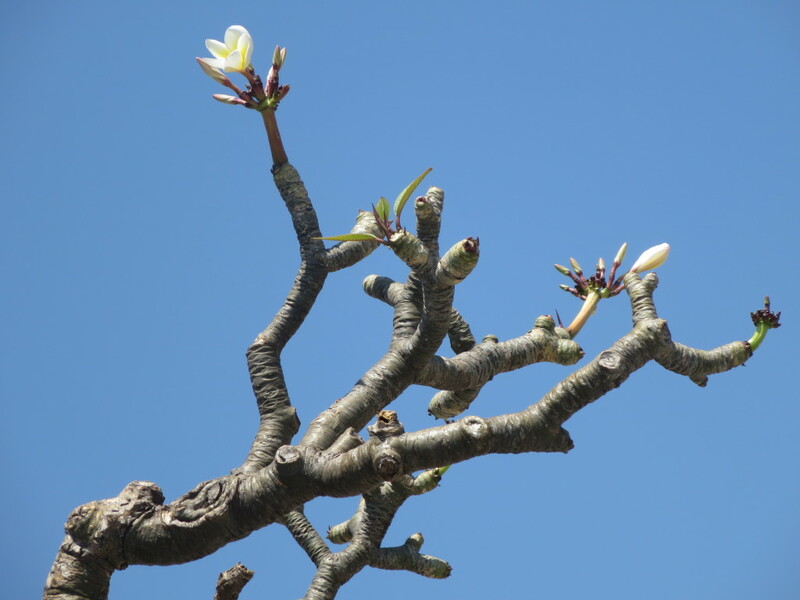 Find a seat in the shade of a blossoming Frangipani tree. Catch the sudden motion of a gecko on a nearby stone out of the corner of your third eye. Frangipani tree in the courtyard of the Hanuman Temple, Hampi, India. Down below, everything is a negotiation or altercation: tourists try to squeeze the Hampi’s sprawling ruins into their vacation itineraries, rickshaw drivers compete for fares, fruit sellers fend off light-fingered monkeys with slingshots. 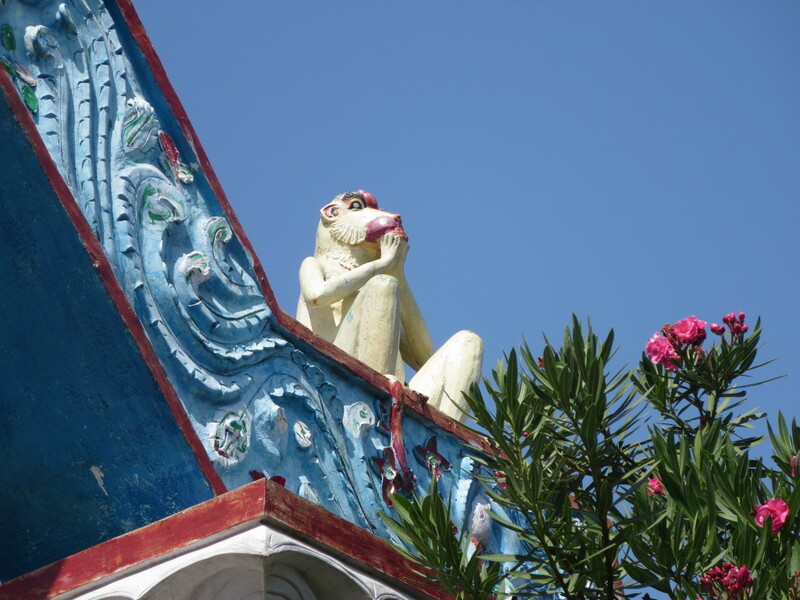 Up here in the temple courtyard, a dark brown man feeds bananas to a pair of perplexed monkeys, skeptical of his generosity and baffled by their good fortune. Press your bare feet into the warm stone. Consider this incarnation, this life you are living now, with all its unpredictabilities and impurities. See the imperfections as testaments that human hands weave the fabric. Blink into the haze, bewildered by your own good fortune. 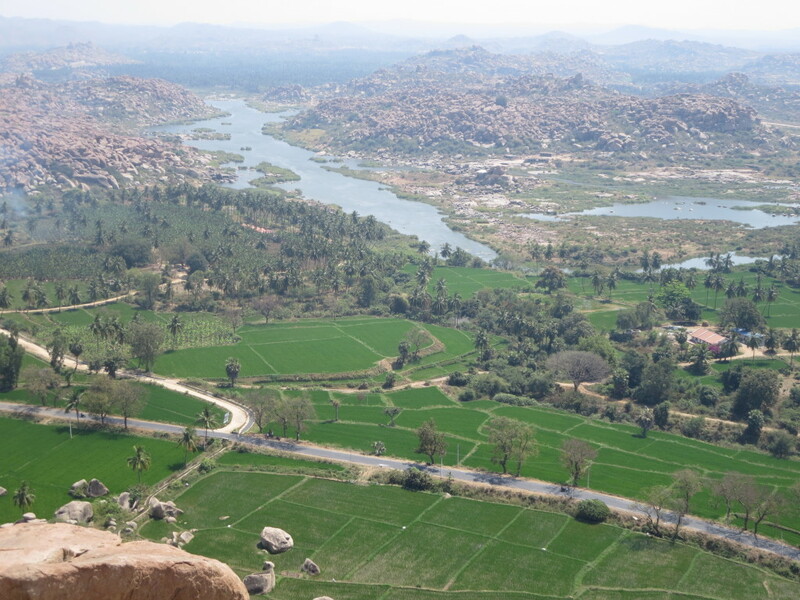 Seeing the sights of Hampi with triple vision.